It won’t have escaped your attention that already this year the stock market has encountered a few bumps on the road. For most this might create a feeling of anxiety and tempt them to react and make changes…harder still is to do nothing and accept that volatility is a normal part of investing. As is often the case looking to the past generally offers us some clues about how the future might play out. If we take the US stock market (see Exhibit 1), the world’s biggest, since 1979 it is amazing to note how common intra-year (any period within a calendar year) declines have occurred during a given year. In fact in about half of the years observed there were declines of more than 10%, and around a third had declines of more than 15%. 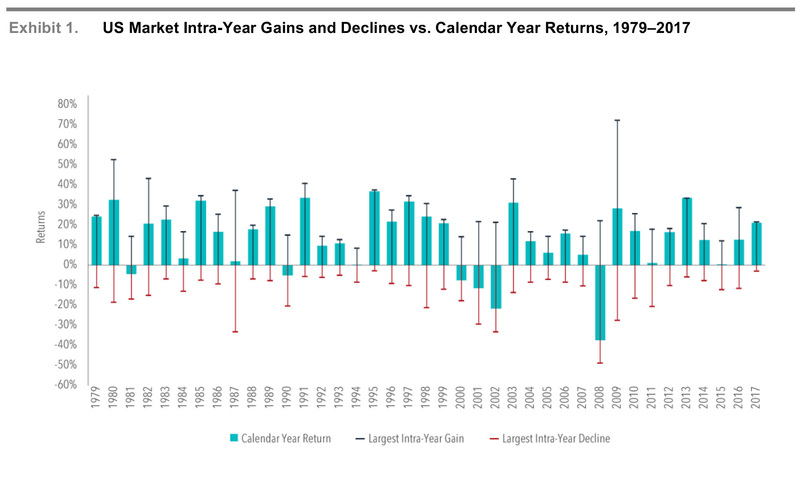 Despite these substantial intra-year drops, calendar year returns were positive in 32 years out of the 37 examined. This goes to show just how common market declines are and how difficult it is to say whether a large intra-year decline will result in negative returns over the entire year. We know by now that it is unlikely that we as investors can successfully time the market, and if we did manage it, it would likely be more as a result of luck rather than skill. Further complicating this it should be noted that a substantial proportion of the total return of stocks over long periods comes from just a handful of days. Since investors are unlikely to be able to identify in advance which days will have strong returns and which will not, the prudent course is likely to remain invested during periods of volatility rather than jump in and out of stocks. Otherwise, an investor runs the risk of being on the sidelines on days when returns happen to be strongly positive. 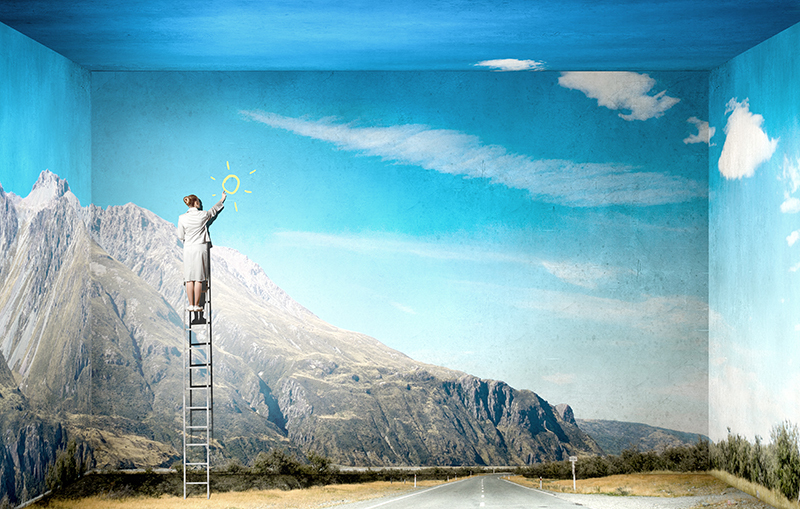 To be a successful investor, what is needed is an attitude of healthy optimism. This idea is based on simple logic which is backed by evidence. Shares have delivered positive returns in the past and it’s reasonable to expect that they will continue to post positive returns in the future. However, it is not reasonable to expect returns to be positive every day. We should expect good days and bad days, with the average being good. And because we don’t know which days will be good or bad, we should act as though all days will be good because we can’t predict them and don’t want to miss them when they occur.